Maintaining pressure all through the second half, Bengaluru FC defeated Mumbai FC 1-0 from a Daniel Lalhlimpuia goal at Sree Kanteerava Stadium. Bengaluru have been a bogey team to Mumbai FC. The outcome of the Kolkata derby also worked in favor of Bengaluru, provided an added incentive to outperform Mumbai FC. Eugenson made a comeback today after staying out for more than 2 months owing to injury but Captain Sunil Chettri had sit out for his injury. Bengaluru pressed and gained corner in the very first minute, followed by a couple in the next 10 minutes. However none gave way to goal. For Mumbai FC, medio Eric Brown was controlling the middle, something that Bengaluru was missing most of the time in the first half. Few positive attack from Bengaluru centered on Kim Song kept the Mumbai keeper busy. 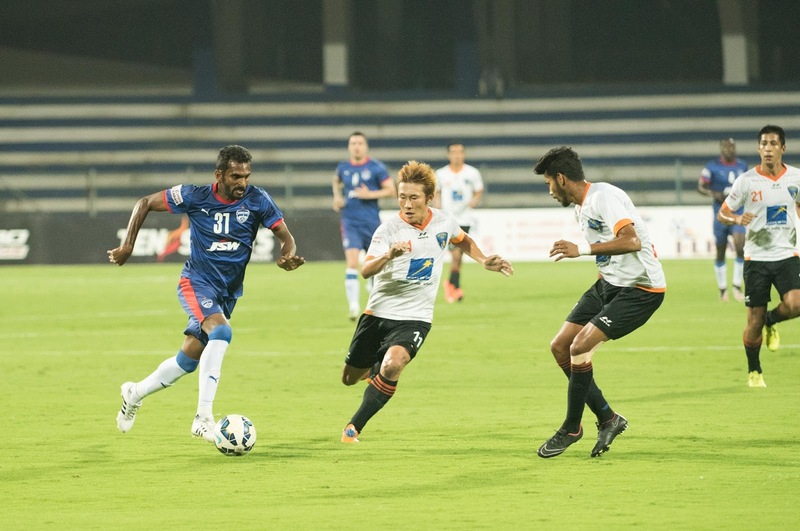 In the 30th minute Pawan Kumar, who turned for Bengaluru until few seasons ago came out of the charge chasing the ball, collided with rushing Kim Song, and conceded a free kick from the good position. Eugune’s low trajectory kick was timely rescued by Mumbai defense. Vineeth made some valiant runs but lacked the final touch. Half-time ended in a draw. Post lemon break, Osano tripped Taisuke Matsugae from behind, which earned a free kick at the top of the box and a caution from the referee. Eric Brown’s kick did not do any good for his team. It was all Bengaluru FC after the first few minutes in the second half. They lost an opportunity in the 58th minute from a constructive run from Seiminlen that went for Vineeth, the latter’s attempt on the goal was blocked by keeper, Kim on follow up set for Thoi and was blocked again. The ah-moment went on for few more minutes originating again from Seiminlen. Another chance went begging for Bengaluru as the combination of Seiminlen and Vineeth could not see the goal from the melee. Substitution by gaffer Ashley Westwood in quick succession gave Bengaluru the much-needed goal. An attacking Udanta scooped the ball inside the box for Vineeth, Mumbai FC keeper made the mistake of the match by letting the ball go, Vineeth pulls the ball for Daniel, who neatly places the ball to the back of the net. With today's win, Bengaluru FC leapfrogged Kingfisher East Bengal to the second spot in the league table with 25 points. Bengaluru FC have started sensing the title with Mohun Bagan going down to their arch rivals Kingfisher East Bengal in the other match today. Either of the two Kolkata outfits and Bengaluru FC, who are separated by only 2 points among them, can lift the coveted silverware at the end of the Hero I-League season.